I managed to get some more work done on my Datsun 510 today. Sort of. I didn't actually work on the car, but rather took a trip to the junkyard and found some parts to upgrade the brakes on my car. The stock struts are going to be swapped out with struts from an 84 Datsun Maxima. Hopefully they'll fit. 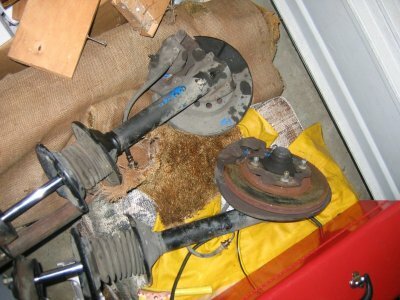 The swap is generally done with 280zx parts... but the Maxima's struts look like they'll work. We'll see. I actually didn't find what I was looking for at the junkyard... which is a little sad. And while I was there, I found a bunch of other things that I wanted but didn't have time to take... like headlight housings from a Fiat, the rack/pinion setup from the Maxima... ugh. So much stuff. I'm so addicted to junkyards. I swear... they're candy-land to me. Only I can't eat the car parts.